If nothing else, “The Hallow” at least gets one thing right: The creatures. You might think that with a creature feature, that should be a given, but there are quite a couple of movies that drop the ball in that regard, and where the final revelation of the creature(s) is a huge letdown. Not so with “The Hallow”, where they’re one of the best things of the movie. It’s a unique design, perfectly executed. I wish I could say the same about the rest of the movie. Apart from the great creature effects, the biggest strength of the movie lies with the cinematography. “The Hallow” looks incredibly well, and offers some great, impressive shots of the woods, which it uses to great effect in order to create suspense. Also, the two leads, Joseph Mawle and Bojana Novakovic, do a great job with their respective roles, and really manage to make us feel their fear, terror and/or determination. The movie also leads up to a great, emotional ending that I enjoyed. The concept behind the creature and their origins was quite nice. And even though it’s just a sidenote, I loved the children’s song that’s playing first in the car and then during the end credits. Unfortunately, “The Hallow” relies mostly on jump scares to create tension, and apart from the incredible cheap last one right before the credits, I saw all of them coming from a mile away. They’re not particularly clever and/or well-built, but rather run-of-the-mill, and if you’ve seen a couple of horror movies in your life, it should be easy to predict them with shocking accuracy. It also didn’t help that I called the ending 20 minutes in. And – an all-too-familiar problem of the genre – sometimes the actions of the protagonists didn’t strike me as particularly clever. For example, they know that the creatures don’t like iron and light, and that they’re after their baby. So what do they do? Well, put it in a wooden cupboard where it’s dark inside, of course! Also, concerning the showdown (hopefully without giving too much away), instead of taking a 50:50-chance, if I were her, I simply would have grabbed both. And as much as I can understand that it was hard for Adam, a scientist, to believe in all this stuff, given his find in the shack right at the beginning of the movie, with the dead deer and that strange fungal, I probably would have come around a little sooner. 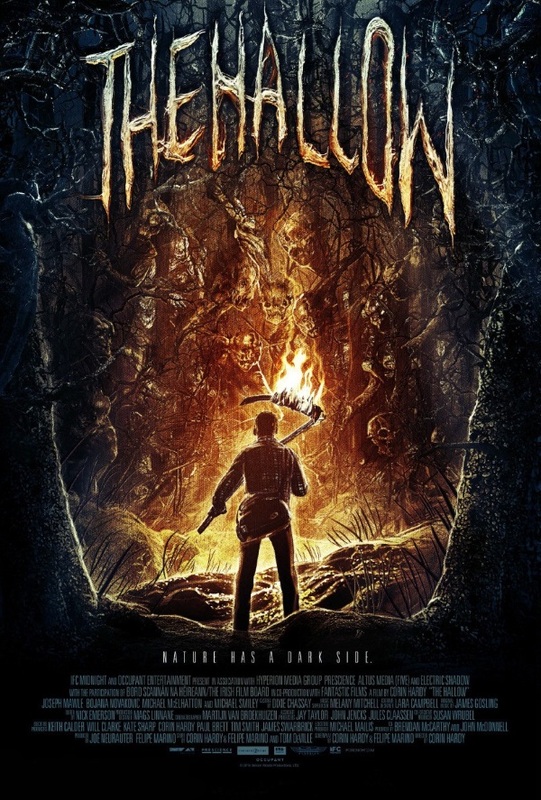 Ultimately, it’s a solid horror movie and a notable first (feature film) effort of director Corin Hardy – whose inexperience, however, is sometimes noticeable, and prevents “The Hallow” from reaching its full potential. This entry was posted in /slash, movie reviews, new releases and tagged /slash, /slash 2015, Bojana Novakovic, Corin Hardy, gb, horror, Joseph Mawle, Michael McElhatton, The Hallow. Bookmark the permalink. Categories Select Category /slash A Geeks Life About this Blog austrian cinema cinema 2014 cinema 2015 cinema 2016 cinema 2017 Eology filmography identities Kino 2013 Lists movie reviews Movie-Flashback new releases Oscars Project Terrible screener Uncategorized Viennale What’s on TV?